"There's children throwing snowballs instead of throwing heads, they're busy building toys and absolutely no one's dead!" Most of us (well, people my age anyway) were probably first introduced to stop-motion animation by low-budget TV shows like Gumby. This led us to believe that stop-motion can only look cheap, unrealistic, and unconvincing. I mean, I don't think anyone was impressed by the fluid motions of Gumby as he battled the fully articulated Blockheads.The Nightmare Before Christmas was my first exposure to just how much can be done with the medium of stop-motion if the right team is behind the camera. And boy, did they assemble the right team here. Jack Skellington (Chris Sarandon, better known as Prince Humperdink in the fabulous The Princess Bride) is the Pumpkin King of Halloween Town. All the other goulies and ghosties look to him to provide their "scare tactics." Jack, however, is sick of frightening people. He feels that there must be more to life, and he thinks he has found the answer when he discovers the door to another holiday town—Christmas Town, to be exact. Jack decides he will do Saint Nick one better and make Christmas his own. It is up to his admirer Sally (Catherine O'Hara) to get him out of trouble and to rescue Santa from some of the less desirable tenants of Halloween Town (Oogie-Boogie in particular!). This film tries to be many things—a horror film, a musical, a fairy tale, and a romance. I am happy to say that it succeeds on all fronts. Ok, I wouldn't call it an all-out horror film, but some of the images are undeniably creepy (check out "the clown with the tear-away face", enough to give anyone nightmares) and the action sequences with Oogie-Boogie may be a bit intense for the younger viewers. As a musical, it is simply wonderful. Of the 72 minutes or so of animation, I would estimate that 30 are songs, and all are relevant to the story and very melodic—every time I see the film, I am singing Making Christmas or What's This? for several hours (minimum). Danny Elfman himself provides the beautiful singing for Jack, and he does such a fabulous job, I cannot imagine anyone else in the role. I especially liked the performance of Ken Page as Oogie-Boogie. He adds real character to a very slight role, and The Oogie-Boogie Song stands as one of my favorites in the film—he really gives it some punch, reminding me of a nightclub jazz singer. Many well-known voice actors perform for the background characters (including Pee-wee Herman himself, Paul Reubens, as Lock) and they really fill out the film—I believed Halloween Town was a real place. The casting director did a wonderful job (with one exception, which I will comment on in a bit). The film is, in essence, a fairy tale - a sort of How the Grinch Stole Christmas in reverse. It fulfills the prerequisites for a fairy tale, that's for sure—the moral (be happy with who you are) is clear without being beaten into the ground (nice, considering the way Disney usually hammers its messages home with a sledge). Finally, the romance between Jack and Sally is not explored in depth, but it seems very true to the characters (and provides a bit of hope for those of you pining away in secret for that special someone!). The biggest contributor to the success of this film would at first seem to be Tim Burton (who wrote the story and designed the characters). While his role was undeniably vital, the real star here is Henry Selick. His manipulation of current stop-motion techniques (and his development of some new ones) allowed the movie to surpass any animated film up to that point in terms of technical achievement. Aside from that, Selick's talents as a director are clearly exhibited here. He has a fabulous sense of mis-en-scene and handles the shifting tone of the narrative extremely well. He gives the film three distinct worlds: the dull, almost black and white Halloween Town, the Technicolor Christmas Town, and the flat, realistic Real World. The movements of the characters (sometimes as many as 10 in any given short) are as intricate as the actions of a real actor would be. Selick had been working with stop-motion for years (most notably with promo spots for MTV), and his experience really shows here. Amazing. The only problem I have with the film (and it is pretty minor) is the performance of Catherine O'Hara as Sally. Something about it just didn't click. It's not that I think O'Hara herself did such a bad job, she was just miscast. Listen to her performance as Shock—her talents as a voice actress are defiantly there. So what went wrong? I have always found Sally's singing voice to be too weak and her vocal performance a little on the bland side, especially when compared to the rest of the cast. But as I said, this is a pretty minor problem in an otherwise perfect film. I only wish Disney had given it the support it deserved when it was in theaters. Image Transfer Review: This is the same transfer that was used on the previous DVD release of the film, and many have complained that it is not 16:9 enhanced. While I can certainly understand those who wish it was, I can't really fault the transfer presented. Black level is excellent (important considering the Halloween Town scenes were shot to resemble a black and white film) and colors are vivid and crisp, with no bleeding reds (visible in the dream-like Christmas Town). I noticed no edge-enhancement or artifacting—this image is darn near perfect. I threw in the minus for the benefit of the anamorphiacs. Audio Transfer Review: This disc features both a DD 5.1 soundtrack as well as a DTS version. I only gave the DTS a brief test, as most people use the DD soundtrack. That being said, this is an excellent mix! I cannot believe how good the songs sound! The score and the vocals are mixed evenly between the center, mains, and surrounds, and they sound simply beautiful. There is no other word for it! During the "action sequence" at the end of the film, the LFE becomes a bit active, although nothing that will knock the house down. I guess I found the track so impressive because it is for a low budget ($18 million) children's film. Very impressive, and a new favorite of mine. 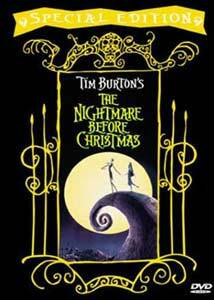 Extras Review: The Nightmare Before Christmas was originally released as a bare-bones disc, but this re-release includes most of the extras from the old LD box set (with some subtractions and one notable addition). First up is the 25-minute documentary on the making of the film. This piece is very interesting, if a bit technical. It illustrates just how much work went into sculpting the characters, building the sets, and animating each frame of the film. Apparently it ran 40 minutes on the LD, but I noticed no obvious omissions. Next up is the commentary with director Henry Selick and DP Pete Kozachik. This too is a bit on the dry side, but I found it fascinating. The two talk nonstop and go into great detail about the difficulties of making a stop-motion animated film. A good listen for fans who want to know every little detail. Also included is a rather extensive still gallery featuring over 450 shots of character designs and concept art. The pictures are divided into three categories: Halloween Town, Christmas Town, and The Real World. Most of these shots are finished, colored artwork, and some would make nice posters! The final major extras are two of Tim Burton's early short films, Vincent and Frankenweenie. Vincent is a stop-motion short about a boy who wants to be Vincent Price (a bit autobiographical, perhaps? ), and Frankenweenie is an homage to '50s horror films that tells the tale of a boy who reanimates his beloved pet Sparky. The picture quality is great on both, and they are pretty entertaining. I don't think I'll watch them often, but they are nice to have. New to this DVD release is a film to storyboard comparison of the town meeting scene. It runs about four minutes, and it gives an idea of how important the storyboarding process is to a film like this. The effect is done with a split-screen technique that works rather well. The usual trailers round out the disc. And may I saw that Disney has created some beautiful animated menus for this release? I absolutely love them. Very in keeping with the film. Note that several short films and MTV promos from director Henry Selick that were included on the LD have been left off of this release (most notably Slow Bob in the Lower Dimensions). These were left off for legal reasons, and were actually only included on the very first run of the LD. Despite this loss, this is an excellent extras package from our good friends at Disney. When they do it right, they do it right. Well, except the disc STILL isn't anamorphic - but I digress. This film has always been one of my favorites. A good part of that is due to Danny Elfman's beautiful singing voice—I am half inclined to go out and buy a few Oingo-Boingo albums! The story is simple and elegantly told, with a lot of humor and affection for the characters; and the set design and stop motion work by Selick and his crew must be seen to be believed. Everything about this film is special, and I recommend it to anyone looking for a family film that breaks the mold.